This is one of a series of gouache paintings, inspired by chinese and japanese depictions of trees, that I have had made into cards. The silver colour has a beautiful soft sheen, which is difficult to show accurately on a screen. These cards are litho printed onto 350gsm trucard with a silk finish. They are blank inside for your own message, and each come individually wrapped in cellophane together with a silver envelope. Free postage to UK addresses. 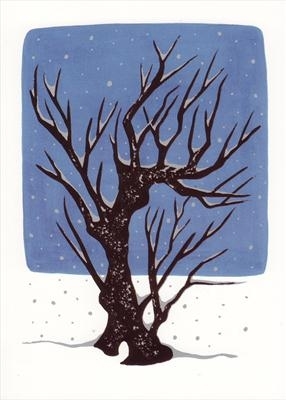 For multiple orders, have a look at 'Tree in snowfall II x 10' or contact me.